India’s one of the leading Gadget Accessory & Consumer Electronics brand. 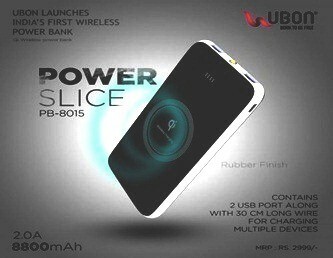 Enough of spending time sticking to the charging wire, ditch the wire with the latest Wireless Power Bank from UBON. Announcing the latest addition to their Wireless Portfolio, UBON, a homegrown consumer electronics brand largely dealing in premium category Headphones, Speakers and other Electronic Accessories, has launched a Wireless Powerbank-PB 8015 for Rs 2,999. The product is available at the company’s website along with all leading stores and e-commerce websites across India. PB 8015, wireless power bank by UBON is equipped with an 8800mAh battery and double USB ports through a 30 cm long wire for charging multiple devices. The device has a one-touch switch that lets users seamlessly turn the power bank on or off, it also has a high-tech display of power capacity, and wireless charging status, which lets users know battery status and its charging functions. The power bank is compliant with the QI enabled devices and comes with a 1-year warranty from 700 service centers across India. Incorporated in the year 1999, UBON headquartered in Delhi is India’s one of the leading Gadget Accessory & Consumer Electronics brand that addresses the need of ‘Connected Consumers’ and ‘People on the go’. With the proper R&D and right use of technology, the brand offers products such as Bluetooth Speakers & Headphones, Chargers, Cables, Protectors & more than 125 accessories.